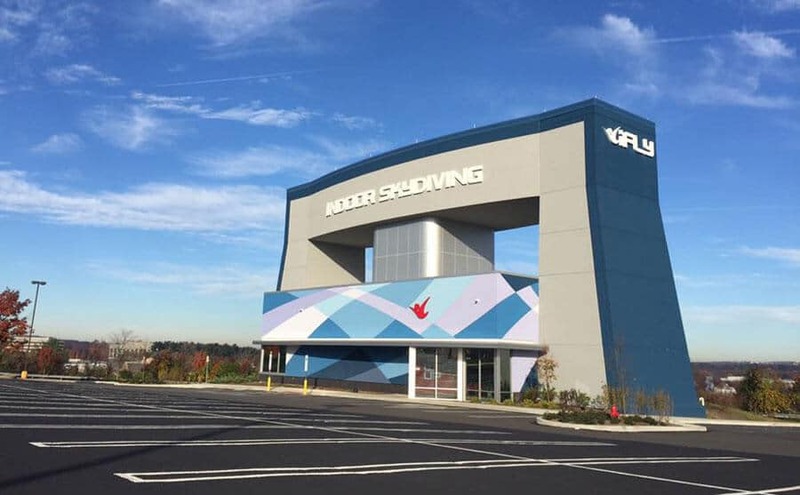 iFLY King of Prussia is located in the Upper Merion Township in King of Prussia, PA. The tunnel is less than 20 miles from downtown Philadelphia. This location sits about half way between iFLY Yonkers which serves New York and iFLY Ashburn which serves the Washington DC area. 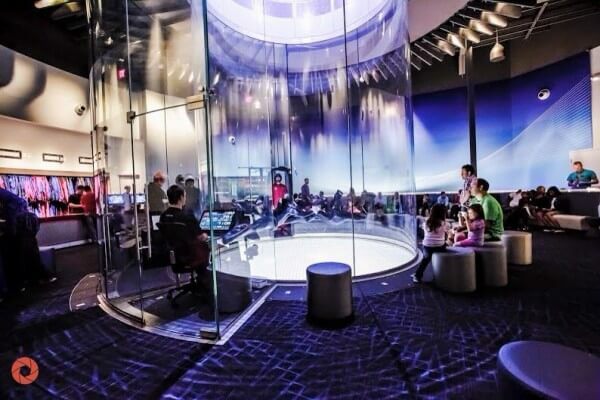 This facility is a newer single level iFLY design launched at iFLY Houston Woodlands. The location officially opened on April 16th, 2016. Average rating of 4.9 from 11 review(s). Thank you IFly for making today’s flight a great experience. You guys also went above and beyond to make sure everything went great. Thank you to the front end staff for hooking me up too with my military discount. Ifly honestly makes your dreams of flight reality! The feeling you get when you're literally flying with no strings attached is an incomparable feeling that I live for! I have visited both IFly Va Beach and IFly KOP and in my 6 total visits I have never been disappointed! The instructors are very well trained in every aspect and it makes the experience even more inspiring and enjoyable!! This is my first review I have even done, so you know how I feel about IFly! We gave this gift to my daughter for her birthday. She was not nervous at all until she felt the wind on her face. The instructor immediately removed her from the area when he noticed that she was upset. The rest of the team and the instructor (WILL) was amazing with her. She got back out there and absolutely loved it! I can not say enough goods things about the staff at I fly. The teachers were amazing the the experience was unforgettable. Talk about customer service. This place is an A plus, 5 stars!!!! It is a show in itself just to watch everyone else. A-M-A-Z-I-N-G! Was super nervous, but it was super easy to learn. My instructor, Casey, was fantastic. I definitely recommend this activity. Although expensive, it was a blast. i have now flown twice, once on my birthday (july 21) with my friend Lacy and the second time (august 23) by myself. I had Dan & Cameron as my instructors, they are both really awesome, laidback & nice. I recommend you guys at least trying it, I also recommend the full helmet but that's up to you, I cant wait to go back to learn more skills, like going from my back to my front, flipping. I learned the second time how to turn, go forward, backward, up, down. I wasn't nervous at all, I got confident and started to jump into the tube for my flight. This was my second time flying and I am looking to make this a hobby. This is a great place to go for this. My instructor Cam heard that I previously jumped at a different ifly location and he helped me get better at the things I wanted to work on.. I would definetly recommend this place to jump! Thank you Ifly ! The facility is amazing! We flew our time and could not have been happier. Our instructor, Chris was incredible. He helped me fly in circles and did a great job flying me to the top. It was a perfect experience. The staff was friendly and the instructor was super knowledgeable in his skill set. Highly recommend this to everyone! Ask for Chris. Staff was friendly and helpful, but still getting into the groove -- they haven't been open very long yet. I bought bulk time before the tunnel opened and then when I went to use it my first time they tried to tell me I had to take a 1st time flyer course. After talking to a few different people they figured out it was okay to just let me use the time I paid for. My coach was helpful but not amazing. I got the feeling he was kind of new to coaching. The team room was comfortable and secure. The tunnel itself was a little on the small side, diameter wise. Paraclete is only 2.5ft wider in diameter but somehow feels much more spacious. KoP looks like there would barely be room for a belly 4-way. You're going to have to fly precisely or be prepared to do a lot of wall smashing. The facilities were all in great shape and very accommodating, as you would expect for a tunnel that just opened. I took away a half star because of the trouble I had to go through to use my bulk time, and another half for the tunnel diameter. Fantastic! Had a great time and everyone there is really helpful and knowledgeable! Great place and great people! Everyone that works there is super nice and helpful, from the front desk to all of the flyers. Instructors I had were and are fantastic! Dustin did a great job and Casey was terrific! Can't wait to get back! Dustin was an awesome coach who quickly assessed our skill level and knew what we were looking to learn.